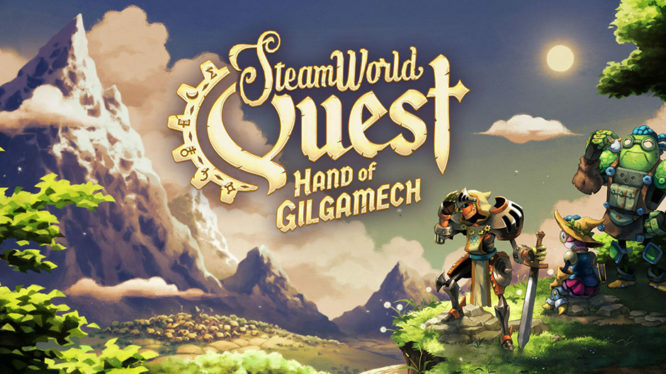 Thunderful Games and Image & Form have announced that SteamWorld Quest: Hand of Gilgamech will launch exclusively for Nintendo Switch on the April 25th 2019. The game will release digitally on the Nintendo eShop for $24.99 / €24.99 / £22.49. Acting as the fourth SteamWorld title from Image & Form Games, SteamWorld Quest: Hand of Gilgamech takes the franchise in a new direction. Inspired by turn-based RPGs and competitive card games, the latest instalment sees players shuffle their way to victory by collecting and crafting their very own deck of cards. Officially coined ‘punch-cards’, players must lead a pack of aspiring heroes to victory by unleashing the various attacks & spells packed into every single card. SteamWorld Quest leaves behind both SteamWorld Dig games’ Western inspired world and Heist’s space pirate characters and opts for a more traditional medieval fantasy setting. As “traditional” and “medieval” as steam-powered robots can be at least. Players will explore the land partaking in quests and defeating enemies and bosses, picking up a variety of rewards along the way. In addition to levelling up the aspiring heroes, they’ll be plenty of loot to equip, new characters unlock and new cards to add to your deck. Thunderful have stated that SteamWorld Quest: Hand of Gilgamech will be available exclusively for Nintendo Switch “for the forseeable future”. The game releases on the Nintendo Switch eShop on April 25th 2019 for $24.99 / €24.99 / £22.49. Assemble a deck of cards in this hand-drawn RPG!